The object­ive of the mech­an­ical test­ing of compos­ite is the determ­in­a­tion of mech­an­ical para­met­ers such as strength and stiff­ness that will be later used on the design of a compos­ite struc­ture. Referring to the clas­sical lamin­ate theory, 5 elastic prop­er­ties (E1, E2, nu12, nu23 and G12) are neces­sary to calcu­late the elastic beha­viour of a long fibre rein­forced compos­ite. This can be reduced to 4 para­met­ers (E1, E2, nu12 and G12) in case of thin lamin­ate compos­ite in plane stress condi­tion. These para­met­ers are usually determ­ined by test­ing flat coupons in tensile and shear modes. For the ulti­mate strength and fail­ure predic­tion of a compos­ite, further tests on compres­sion, shear and inter­lam­inar strength are required for determ­in­ing the proper para­met­ers of the fail­ure criterion model. The test meth­ods outlined in this section merely repres­ent a small selec­tion avail­able to our custom­ers. However, taking into account the terms and condi­tions of the corres­pond­ing stand­ard (DIN, ASTM, EN, ISO,...), we perform meas­ure­ments using only calib­rated test equip­ment. For tensile tests the fiber-rein­forced plastic samples are prepared with tabs to prevent a break in the restraint. For the tensile meas­ure­ment either a video extens­o­meter or a plug-on extens­o­meter avail­able in vari­ous sizes is used. For the differ­ent power ranges we use force sensors. Mechanical para­met­ers are determ­ined and the thermal beha­vior is invest­ig­ated in the temper­at­ure range between -269°C and 600°C. Here, the inter­lam­inar energy release rate G1C is determ­ined , which describes the required total energy for the produc­tion of a defined crack growth under normal stress . The tensile force required for crack propaga­tion is recor­ded on the traverse and a force-displace­ment diagram is created. The tests are carried out between -196°C and 600 °C taking into account DIN 65563. For meas­ur­ing the deflec­tion and bend­ing strength of fibre rein­forced plastics we offer 3-point as well as 4-point bend­ing tests. The mech­an­ical para­met­ers are determ­ined between -269°C and 600°C by use of a moving coil extens­o­meter or cross head move­ment of the machine. Laminates composed only of unidirec­tional fibrous laminae, with the fiber direc­tion oriented either paral­lel or perpen­dic­u­lar to the fixture rails. Laminates composed only of woven fabric fila­ment­ary laminae with the warp direc­tion oriented either paral­lel or perpen­dic­u­lar to the fixture rails. Laminates of balanced and symmet­ric construc­tion, with the 0° direc­tion oriented either paral­lel or perpen­dic­u­lar to the fixture rails. Short-fiber-rein­forced compos­ites with a major­ity of the fibers being randomly distrib­uted. For our analysis of poly­mer matrix compos­ite mater­i­als we use the stand­ard ASTM D3518 / D3518M - 94(2007). The described test method determ­ines the in-plane shear response of poly­mer matrix compos­ite mater­i­als rein­forced by high modu­lus fibers. A uniaxial tension test of a ±45° lamin­ate is performed in accord­ance with Test Method D 3039. The in-plane shear stress in the mater­ial coordin­ate system is directly calcu­lated from the applied axial load, and the related shear stress is determ­ined from longit­ud­inal and trans­verse normal strain data obtained by the extens­o­met­ers. The inter-laminar shear strength of carbon fibre rein­forced plastics and unidirec­tional lamin­ates are determ­ined in a 3-point bend­ing test. The resist­ance to inter­lam­inar shear stress paral­lel to the layers of the lamin­ate is meas­ured in accord­ance with DIN EN 2563. This test provides inform­a­tion about the qual­ity of the resin-fiber bond. To determ­ine the compres­sion strength and the compress­ive stress of fibre rein­forced plastics, pres­sure tests are conduc­ted. Furthermore, we determ­ine the compres­sion and the E-modu­lus by use of a video extens­o­meter (depend­ing on the sample dimen­sion). We can perform 3-point or 4-point bend­ing tests on large fibre-rein­forced plates. This means that advant­age­ously even large compon­ents can be tested as a whole. Tensile, compres­sion, shear, bend­ing and ILSS tests on fibre rein­forced plastics can be conduc­ted in our cryo­stat in liquid helium temper­at­ure close to abso­lute zero (down to 4 degrees Kelvin). These tests are performed on mater­i­als that are specific­ally designed for applic­a­tion in space tech­no­logy. 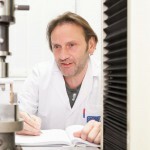 For thin films and fabrics creep tests are carried out at temper­at­ures up to 100 °C. For a vari­ety of sample shapes, we can construct indi­vidual jigs and thus conduct tests which are custom-tailored and meet specific customer desires and require­ments. To determ­ine the strength of compos­ite rings, we use the stand­ard ASTM D 2290. The facil­ity in use prevents bend­ing moments as far as possible. Furthermore, we modi­fied the design so that a plug-on extens­o­meter for determ­in­a­tion of the elong­a­tion can be applied. Single-lap speci­mens are econom­ical, prac­tical, and easy to make. Special speci­mens and test meth­ods have been developed that yield accur­ate estim­ates of the true shear strength. These meth­ods can elim­in­ate or minim­ize many of the defi­cien­cies of the single-lap speci­mens, but are more diffi­cult to make and test.